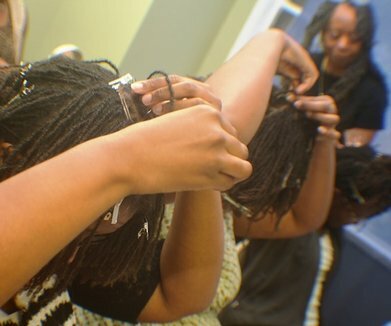 Learn how to maintain your own Sisterlocks. Once your Sisterlocks have matured to a certain point, and your Consultant gives you the OK, you may enroll in an official Sisterlocks Retightening Course. ​ instructs individuals how to maintain their own hair. Note: FOR PRACTICING PURPOSES, PLEASE DO NOT RE-TIGHTEN A SMALL SECTION OF YOUR HAIR IN THE CROWN OR SIDE AREAS FOR 3-4 WEEKS PRIOR TO THIS CLASS. ​Who is Eligible to Take a Retightening Class? ​1. You have Sisterlocks and no other hair locking system. 2. Your hair is well maintained - NO MAJOR DAMAGE, REPAIR ISSUES, EXTENSIONS OR PROBLEMS. 3. Your hair has passed completely through the Settling-In phase. (Depending on hair type, this can be 6-months or more). 4. Obtain your locking pattern information from your Consultant. Retightening classes are held during the same weekend and at the same location as the 4-day training class. Normal Retightening class time is on the first day of the 4-Day class, from 4:30 to 6:30. Times and days may vary because of special events, so please confirm all dates, times and locations on the Training Schedule. Re-confirm all information 1-week prior to class. (CLICK HERE to select your class Date/Location from the 4-Day Training Schedule.) When ready, you may enroll below, or from the Training Schedule page for your class location. The cost is $250 (NOTE: NYC and Overseas price may vary). LAST DAY TO MAKE PAYMENT IS THE MONDAY BEFORE THE CLASS. Clients who have had their Sisterlocks/Brotherlocks for a minimum of 6 months are eligible to take this class. (Time frame may be longer if the locks are not settled in and stable.) Individuals must provide the name of their Consultant, and their locking pattern in order to enroll. Please make sure you meet ALL requirements before you enroll! This class is fully refundable up to 3 days before the class day. Non-attendance is NOT a valid reason for a refund. Once you have read this entire page and verified the date/time/location of your Retightening Class, CLICK HERE to enroll.